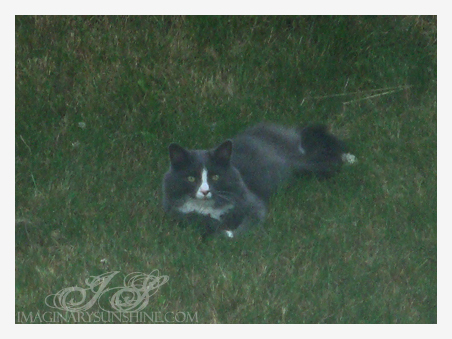 For the last little while (since around the end of May), this cat has been showing up in the area. It’s pretty big looking, really fluffy (and well groomed, so I’m pretty positive that it’s not a stray) and seems to have no issues being around humans as I can get within a metre of it before it starts to run away (don’t worry – we haven’t put out food or anything for it, just some water on the really hot days – the birds seem to enjoy the little bowl of water too!). It doesn’t have a collar or anything like that, which seems like a bad idea, since it is obviously an outdoor cat that gets taken care of. It shows up around 5pm and has stayed in our yard until as late as 10pm before it wanders off. It likes to lay down in the grass in the shadow and it chases butterflies sometimes. I call the cat ‘Mr. Kitty’, despite the fact that I don’t know if it’s a boy or a girl. My parents jokingly refer to the cat as my cat because I get all excited when I see it, and this cat is the reason why I really want to have my own cat now. He’s got long looking fur, white stripe down the front and a white torso-ish area, his front two paws have a small patch of white fur on each and his back legs are white from the paws up until about the knee area, his tail is all gray like the rest of him. And he’s completely and utterly adorable and I’m smitten with him. Aww what a cutie! We had a cat walk into our garden quite a lot and do his business in our garden… he (she?) was nasty-looking though, wasn’t quite appealing to the eye mostly because it was quite fat. This one looks lovely though. That is such an adorable kitty! I *should* have a kitty! Too bad I live at home with my parents though, lol. I’m definitely going to have a pet when I move out though! aww how cutie! when we had shadow outside he didn’t wear a collar either, because when he would fight they would always come off. he did manage to keep a few flea collars for a few months at a time, every now and again. cats aren’t as loyal as a dog, but i have quite enjoyed shadow, and now sam. they are all so unique with their personalities as well. Ohh, maybe that’s why this cat doesn’t have a collar? I guess it’s possible. If I had a cat, I’d try to make it keep a collar on though. Although, knowing me, I’d keep an indoor cat because I live in an area where there’s bear and coyote sightings all the time in spring/summer/autumn. Theres no way hes a stray! He just looks way too groomed and whatnot like you said. We have alot of strays around our neighborhood and you can definitely tell the difference. think I’m sortof back in the webdesign world..
Awww he’s so pretty. We had a stray cat several years ago. I called him Orangey just cause he was orange. We eventually found out that he belonged to the people down the road, however, he always stayed at my house. We did eventually start putting food out for him and water just because he was always there and he didn’t seem to go home much because eventually the people moved and didn’t take him. So, I’m guessing they didn’t really care. I think he’s dead now though because he hasn’t been around for like 2 years. He was around for a long time though, so I don’t know. I love cats though. Yeeeahh we arent going to live with her at ALL so.. yeah. Everything will be worked out (apartment, job) before we move..dont worry. Definitely gonna add more tutorials. Aww 😀 You should totally adopt him! If you don’t want him to run away when you get closed to him, you should try to approach him a little more every day. Another trick would be to buy a can of treats. Shake the can and throw/give him a treat. If you do this often, one day he will approach you himself when you shake the can and chances are he won’t run away from you anymore. Despite his lack of a collar, the cat is really obviously well-groomed – aka he belongs to someone already. It’d be awful to coax someone else’s pet into staying around me when he already belongs to someone else.